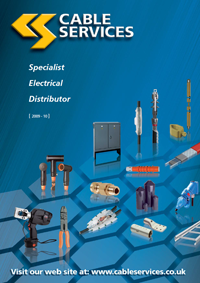 Cable Services distribute service connections from the market leading manufactures: Tyco, Sicame, WT Henley, Lucy Switchgear and Prysmian and have over the years acquired a wide expertise in the installation of the whole range of service connections. Tyco and Sicam 2 and 4 way low voltage link boxes. WT Henley and Lucy Switchgear house service cut outs including heavy duty cut outs, multiway service & rising main distribution boards, , multiwat service heads and insulated connection boxes. Scottish Power Approved Low Voltage Resin Filled Joints from Tyco Electronics. Underground cable protection including cable marker tape, heavy duty warning tape and cable protection covers. Cable protection guards in high impact black U-PVC and galvanised steel. Prysmian BITHANE three part low density polyurethane resin. Our vast experience coupled with stocks unequalled anywhere in the UK makes Cable Services the only choice for Service Connection products. We are distridutors and stockists of a wide range of housing connection applications which are listed on our main website. This micro site is a resource for specific manufacturers information on the range of service connections we supply and provides in depth information and specifications. Modular link box body kit in 2 and 4 way configurations, accepts most LV cables including CNE (95mm2 - 300mm2) and those with full sized sectoral neutral / earth conductors. LVD / FLB / 2 / 3C - Low voltage 2 way Underground Link Box (Insulated), 800amp rated for 70 - 300mm2, 3 core CNE cable. LVD / FLB / 4 / 3C - Low voltage 4 way Underground Link Box (Insulated), 800amp rated for 70 - 300mm2, 3 core CNE cable. Henley Series 7 range of House Service Cut Outs for combined neutral and earth (CNE) cables. Henley Series 6 range of House Service Cut Outs for combined neutral and earth (CNE) cables. Benolex high impact black U-PVC protection guards and galvanised steel protection guards. Prysmian 5 litre ‘BITHANE’ three part low density polyurethane resin. Cable Services are able to offer full technical support for the full product range of service connection products.